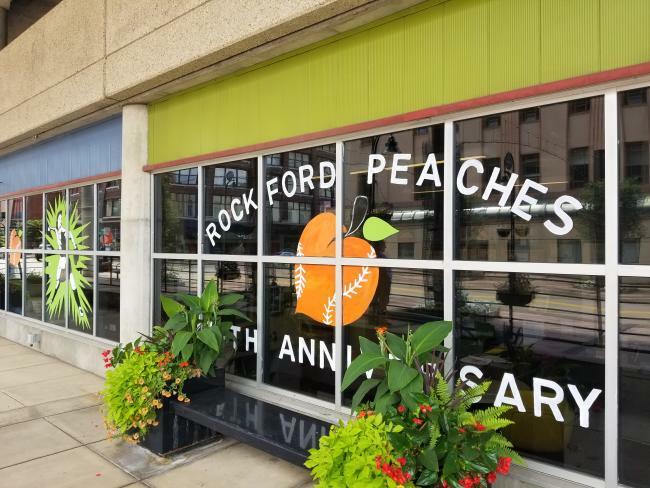 August is National Peach Month and we have an extra reason to celebrate here in Rockford. You might already know it’s the 75th anniversary of the All-American Girls Professional Baseball League (AAGPBL) where our local team, the Rockford Peaches, captured the hearts and attention of Americans, and continue to do so. Featured in the movie A League of Their Own, I wanted to look at how the Rockford Peaches’ legacy lives on in Rockford today. 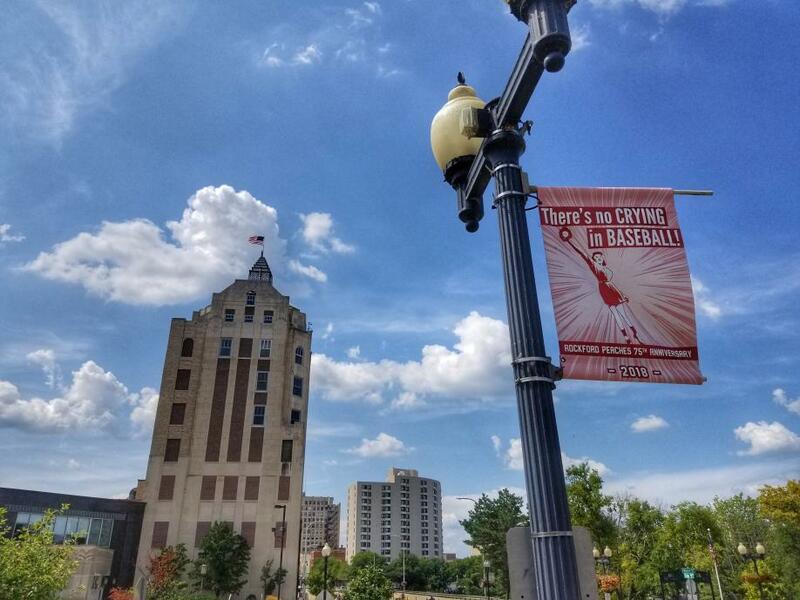 Banners can be found along the streets in downtown Rockford. With quotes from the movie “There’s no crying in baseball!” and “I like the high ones!” it is a fun way to tie the movie’s popularity into the celebration. 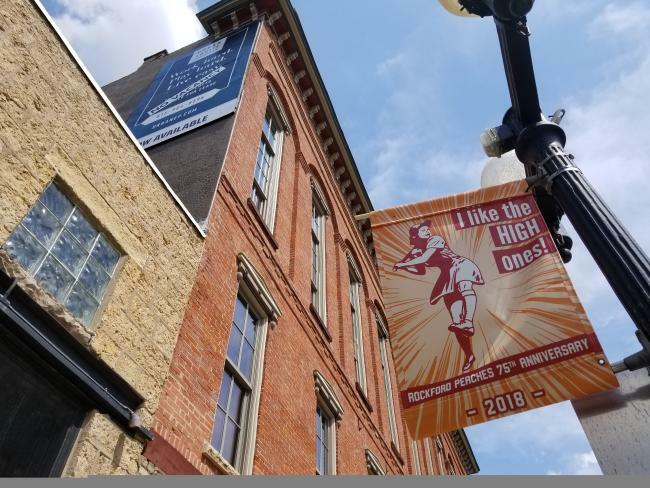 Our downtown has come a long way with efforts to beautify public spaces and these banners add to the color found throughout the area. Outside the Rockford Area Convention and Visitor’s Bureau the windows have been painted by artist Therese Rowinski from the 317 Studio and Gallery. The windows follow the same theme as the banners and can be found at the corner of Main and State Streets. Take a trip back in time and visit Beyer Stadium. The field was home to the Peaches during their time in the AAGPBL from 1943 to 1954. The dugouts are painted with murals of the players and logos from the past. When you’re there, it’s fun to imagine being at a professional women’s baseball game cheering on your local team and wondering what it would be like. The wooden backstop adds to the historic feel with peach colored flags flown above the field. Be sure to read the history on plaques and monuments, following the newly poured cement path. Beyer stadium has had countless hours put into restoring it to its current condition. 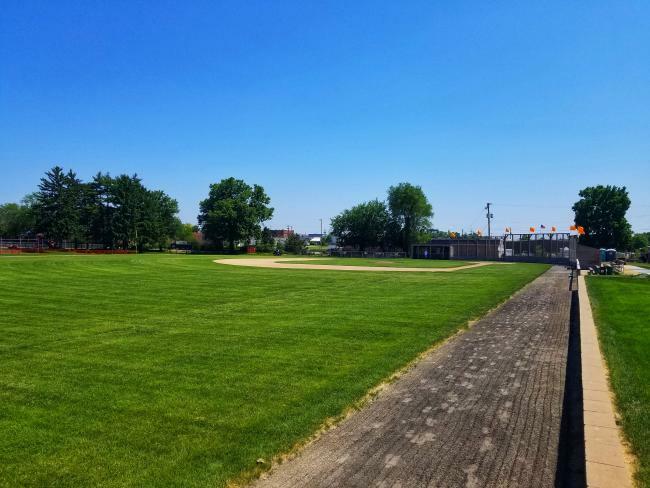 The Rockford Starfires, a women’s baseball league, currently uses Beyer Stadium for their home games and proudly carries on the legacy of the Peaches. Across from Beyer Stadium is the future site of for the International Women’s Baseball Center and will feature educational, training and a museum portion. Part of their mission is to protect, preserve and promote all aspects of women’s baseball. This is a huge opportunity for our region to promote and honor the Peaches and encourage the future of women’s baseball. Girls ages 11-18 from across the United States and Canada come to Rockford for the Baseball For All Nationals tournament. The Opening Ceremonies and games take place at Beyer Stadium. This year players from the AAGPBL gave opening remarks and it was neat to see how impactful moments like these are. 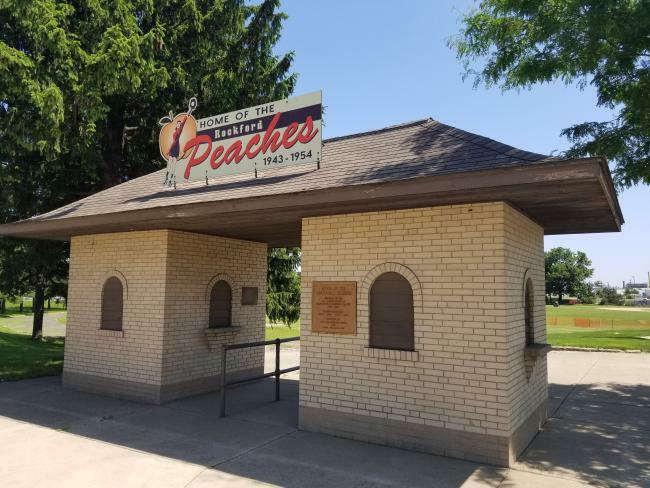 Whether it’s strolling the streets of downtown, watching A League of Their Own or taking a trip to Beyer Stadium, we all have a way to connect to the past through the Peaches. Most importantly, we also have a way to honor their legacy and continue moving forward building upon their foundation.